Moe and his wife have also been good neighbors to our planet. Their beautifully renovated 1711 house (eleventh-oldest in Needham, Moe says with town-pride) has 22 solar panels; all the lights are LED; the historic windows were modified to be double-paned; the front lawn has been replaced with a water-sipping ground cover; the kitchen waste gets composted; and, just before we met for coffee at the French Press, Moe had changed his newspaper subscriptions to digital – except for Sunday. Moe is the first member of his board to receive his packets digitally, further saving paper. Moe enjoys life, and one of his pleasures is cars. He used to drive a standard shift Miata, which his daughter learned to drive when she was 10 in case of an emergency. (For Moe’s fail-safe instructions on how to teach driving a standard shift car, see end of post.) 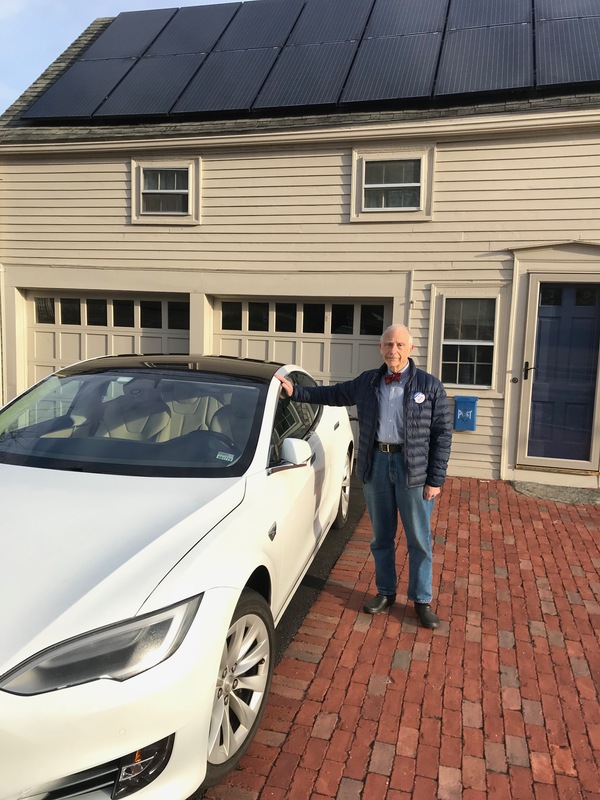 He also owns a used hybrid Lexus 450h, but it has taken a definite back seat to the fully electric vehicle: a beautiful, white Tesla Model S. What do you like about it, I ask. Moe’s responses come quick. It is a thrill to drive. And, he says with a sly smile – you get a great App! It allows you remote access to your car, your trips, and information about where to charge. Another enjoyable aspect, for the very sociable Moe, is the community of Tesla drivers. They meet at the Tesla charging station in Dedham – where the charge is free. It takes about 20-40 minutes to get a full charge, but the next generation will be able to charge faster, Moe says. As they wait, the owners share bits of insider-Tesla minutiae, using their own Tesla lingo — getting “iced” means a non-EV (Internal Combustion Engine) taking up an EV charging spot. What about long-distance travel, I ask? Not a problem, says Moe. He and his wife have gone to New Hampshire and Maine, using the well-spaced Tesla charging stations. People go all over the country, he says. It’s the wave of the future! Addendum: Moe’s method to teach a person to drive a standard in five minutes – getting over the hardest part: releasing the clutch. Go to a level parking lot with space. Press down the brake (right foot) and the clutch (left foot). Put the car into first. Release the brake. Then gently release the clutch until it catches and the car starts to move slowly forward (no need to press the gas). Repeat this until you get a feel for the clutch. Now, you can build on this skill to add gas and shift to the other gears. Post-addendum: There are no EV’s where this skill is required. This “Neighbor Spotlight” is one of a series about ordinary people in Needham doing extraordinary things to be a better neighbor to planet Earth. Please be inspired! Babette Wils is a Needham resident and active Green Needham volunteer. Babette is stepping down from a career in international education consulting and stepping into a career as a food forest farmer. Read more from Babette at her BigFoot Gardens blog.